Is The Ebook Market Shrinking? I was talking to the lawyer of a big publishing house the other day. We were discussing ebooks, and he made the claim that ebooks were just a fad, and one that is dying off at that. Obviously, this surprised me, so I asked him about his sources. “Sector publications,” he said, somewhat vaguely. He was right: several publications have been making similar claims in the last 3 years. I even posted about the supposed shrinking of the US book market back in 2015. But our chat made me think it might be time to see what has happened since. It all started with a 2015 Nielsen Pubtrack estimate which said that 6% fewer ebooks had been sold in the US in 2014. A subsequent Ink, Bits & Pixels post convincingly showed that Nielsen’s estimate of 223 million ebooks sold in the US was completely erroneous. Ink, Bits & Pixels cites not one but two sources which say that the US ebook market is at least twice as large as that. The first source is the pseudonymous Data Guy (yes, the one behind the famous Author Earnings Report). 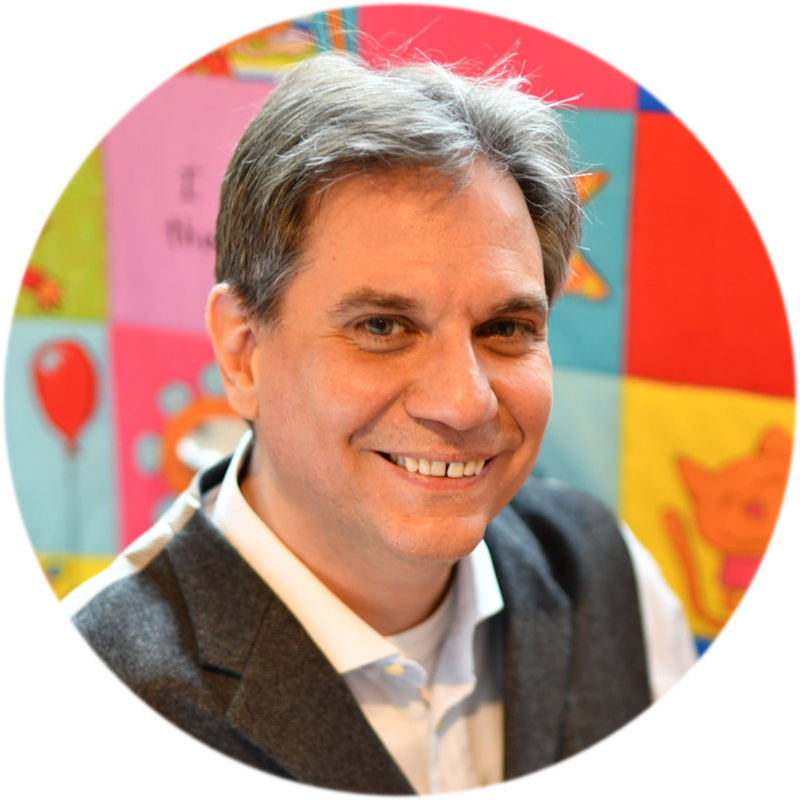 His calculations suggested that around 513 million ebooks were sold in the US ebook market in 2014 – twice as many as Pubtrack estimates. The second source is more eponymous: the Association of American Publishers itself. Their annual estimates of the US book market estimated 510 million ebooks sold in the US in 2014 (much closer to Data Guy’s estimate). Yes, the AAP says that the US ebook market is over twice as large as Nielsen had claimed. It turns out that Nielsen widely over-estimated its ability to track the US ebook market. Nielsen’s number is so far off because it thinks that the 30 publishers it tracks represent 85% of the market when in reality they represent around half that number. This trend continued in 2015 and 2016, as their latest author earnings report shows. 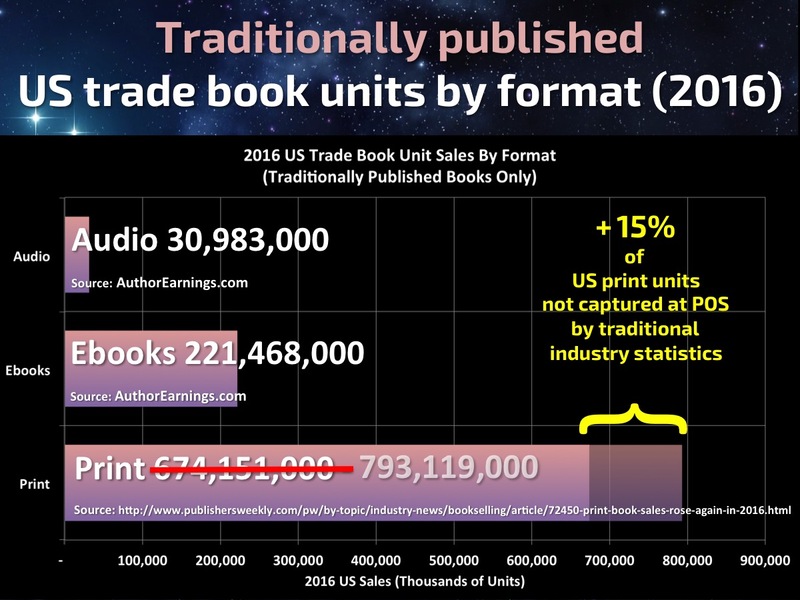 US trade print sales rose in 2015 and 2016 because in 2015 “agency” contracts eliminated Amazon’s discounting of ebooks from large traditional publishers. So, in mid-2015, Amazon raised discounts on their print books instead. Which means that the celebrated increase of print was really publishers celebrating Amazon gobbling up Barnes & Nobles, Target, Walmart, and other brick-and-mortar bookstores. However, in mid-2016, Amazon decreased discounts on print books back to the 2014 levels. 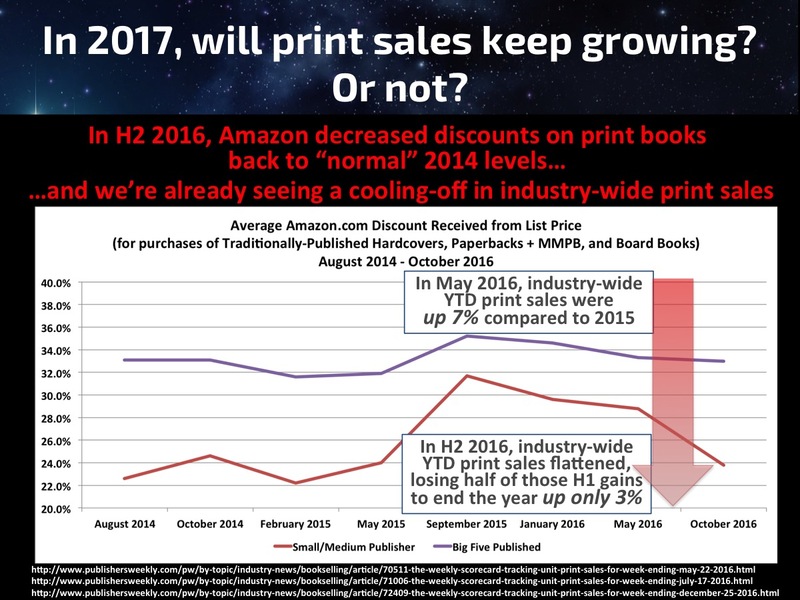 As a direct result, print sales immediately dropped, leading to an increase of only 3% to 2015 (compared to an original forecast of 6%). This was actually lower than Amazon’s ebook sales, which grew by 4%. Even that, however, isn’t taking account of Indie ebooks and Kindle Unlimited. When someone includes these, it emerges that ebooks sales are, in fact, over twice as large–485 million instead of 221 million! The two slides below reflect that fact: the top one show the numbers when one excludes Indies (as Nielsen does), whiereas the bottom one includes both Indie sales and Kindle Unlimited ones. This is not a statistical error; it’s enough to completely change (dare I say, end?) the conversation about the supposed ebook’s decline. As Author Earnings argues, the real question nowadays isn’t Print vs. Digital: it’s Brick & Mortar vs. Online. In other words, Amazon vs. the world. Mmm. The ebook market may be shrinking for those who do not promote their books. I was contacted today by a small press asking me to promote its author’s books. Hey! My answer: Are you as a publisher and is your author going to promote my books and all of my member books in eNovel? Bet not. Their authors are stumping the conferences to move print editions. Great. But the ebooks are sucking mud. Be interesting if I get an answer. I actually don’t give a fig for stats and if the digital market is growing or shrinking. Here is my fact of life: When I promote wisely, I move books and usually have a lovely halo effect. When I don’t promote, the halo effect keeps royalties pouring into by bank account until the next promotion. I am so not a household name. Most indies are not. But we have our niche, we have followers, fans and readers. I love visiting book stores, choosing books that appeal to me. But I can tell you there are thousands upon thousands of books on the shelves that never see a sale. They ain’t gonna earn out. 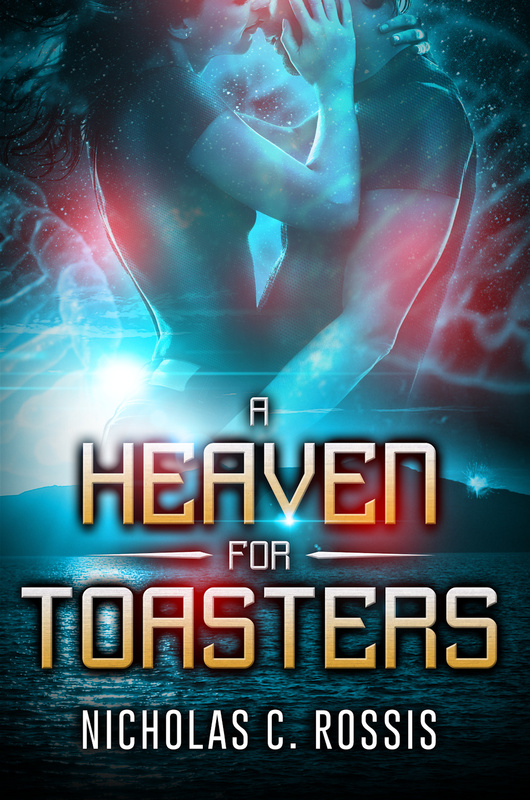 The author will never see a royalty check. The last time I visited a B&N, there was not a dozen readers/buyer in a humongous store. NOT less than six were cozied in comfy chairs, reading for free, books they pulled from the shelves and returned to shelves when finished. I like Data guy and like where I’m ranked. Thanks for doing the research, Nicholas, and putting the results into this cogent explanation. My older non-fiction titles are still handled by traditional publishers while I have moved to indie for my fiction. I still have ties with the trad industry, and find that generally they don’t seem to want to take the effort to get to grips with anything other than print. I have had to explain to a couple of publishers and distributors why it is stupid to price ebooks at more than $9.99. Since many continue to do so, one can’t help but wonder if they are trying to undermine the e-market in favour of print. Old habits really do die hard… Thank you for sharing your experience, Bronwyn! I read far too many books to pay publisher prices. Most of my reading is indie in the $2.99-3.99 range and Kindle unlimited. While I might pay up to $6.99 occasionally, I absolutely will not pay the $11.00-14.00 dollar range of big house publishing. And as many of the indies mature as writers I’ve seen the quality of their editing and proof reading go up. Michael Anderle and his author group are doing some amazing things. Oh, my. You’re playing my song. Love your work! It’s mad that in the era of big data, truly big data is harder than ever to come by. But like they say, in the Kingdom of the Blind, the Statistician is King. Right?! Yep, I hear that expression all the time. In fact, not a day goes by that I don’t. On average, of course. Just my humble opinion but ebook prices seem higher. If that is true and if it is the publishers are raising their authors ebook prices then some ebook readers are not going to buy them. Not to say some indies have high prices (high to some of us means over $5 for an ebook). That might not skewer the publishers results and I could be totally wrong. Having said that, reading the articles you mentioned earlier, I got the impression the publishers were skewing the facts. Thanks to data guy and others, it is clear both sides have different POV’s. Thank you, Janice! Previous data available on Author Earnings show that Indies do, indeed, price their ebooks lower than publishers most of them at $2.99 and $3.99). This probably reflects the publishers’ higher production costs. Determining market scale has always been an issue – as I understand it, here in NZ the ‘best seller’ list produced by Nielsen didn’t include the sales of our main book chain, which had its own separate list. The issue with whether print or e-book is rising or falling, to me, is reflective of the general diversification of media; instead of one choice (a print book), which was all we had a generation ago (leavened with a few audio books), we now have print, e-readers, and audio in increasing numbers. There are also many ways of obtaining them, thus complicating the methodology for capturing the sales statistics. The question is the scale of the total market (and, I guess, how much of that income can then be funnelled into author income). As you point out, it’s not likely to be easily identifiable, worldwide, on current data. Very true. It’s not that hard to measure Indie sales, though, as Author Earnings has demonstrated. I believe it’s more of a mentality thing. Big publishers must be deluded if they think they’re not going the same way as the big record labels. People do like to go to a real shop every now and again and buy a real CD or vinyl record by the artists they love, but increasingly the vast majority of new music is bought online or streamed. Artists can either crowd-fund new albums (through sites such as Pledgemusic) or run their own label. And we’re seeing similarities in book publishing. Very interesting Nicholas and we have found similar anomalies especially those who do not count ASINs only ISBNs when they are publishing numbers. Considering the number of authors using Kindle to publish, it is a gross misrepresentation of the market. We are now routinely doing Mobi and Epub versions for our authors which also confuses the issue as an author can have three different versions and four or five if they go into audio or have translations all with different ISBNs. I do think a great many of the pronouncements issued by the publishing industry are attempts to bolster their shareholder’s confidence in the future but I look at the changes in the last twenty years that I have been Indie, and if reflected in the next twenty it will be a completely different industry. Look who’s sticking their fingers in their ears and pretending they don’t know about … wait for it … you guessed it … indie publishing!!! … **swoons and reaches for the smelling salts** Oh the horror of it all!!! OF COURSE publishing houses are seeing a ‘decline’ in ebooks, because, a) they find creative ways not to include them in their mysterious and magical accounting, and b) they consistently price their ebooks higher than the print version, and voila, the canny customer buys the cheapest version. Pricing is a big factor in this. I understand publishers; they have huge costs compared to Indies, who are smaller and nimbler. As a result, non-Indie books tend to be outpriced. I think that the difference in estimation may depends on the source, and by this I mean ‘professional’ or ‘indie’ source. Professional sources will understand ‘books’ are a professionally created product that addresses all the requiremts in terms of quality, process of production, likelihood to return the money investment and adherence to the publishing laws. Most indie ebooks don’t adhere to these requirements. Lets face it, most ebooks are the digital age equivalent of our ancient time cyclostyle panflets. Whis is why traditional publishers in general are reluctant to consider them competitors or even equals and don’t calculate them in the statistics. 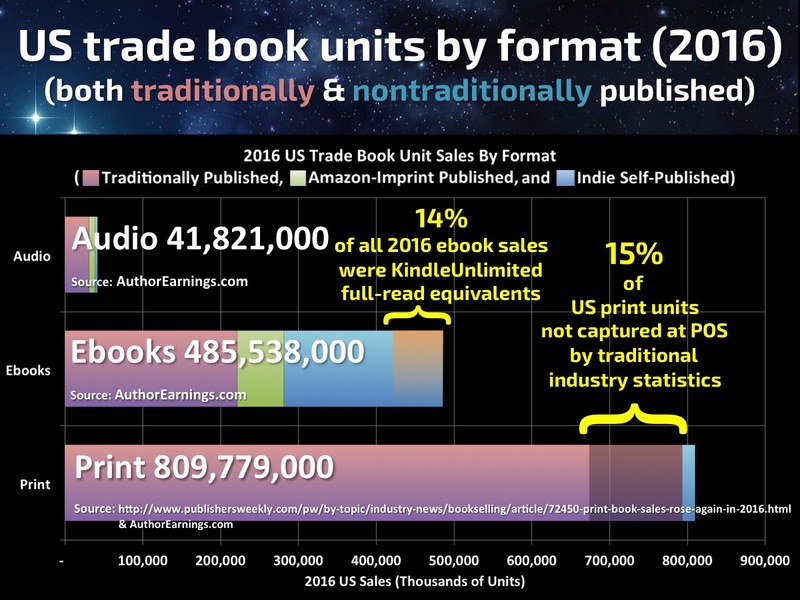 So it may be true that ebooks in general are grawing in number, but it may also be true that the number of books that equal the parameters of the traditional publishing industry are shrinking, because producing that kind of product is becoming more and more expansive. Of course any of us indie authors will consider ourselves part of a very large market,, but on the professional industry side – by which I mean enterprises that live off and invest money on this activity in order to get an income because if they don’t they will be put out of business – there will be very different economic parameters. Personally, I think both estimations are probably true, depending which parameters you’re considering. This is a provocative and interesting point. Kind of like if the tv industry was talking about slumping ad revenue, but then people contradicted that with youtube ad sales figures. Is youtube TV? My kids think so—they make no distinction between network TV, netflix, and youtube. But the suits in Hollywood and New York probably don’t consider youtube videos to be in the same industry they work in. Lies, damn lies, and statistics, I suppose. I think the difference is less in the medium and more in the process. Some YouTube videos are equal to films (though I’ve seen very few, YouTube videos don’t struck me as presenting themselves as competitors of feature films, generally), but most are not. they don’t even intend to be. Many are self-made videos that can hardly even be considered films. The vast majority are video that don’t have any pretention to be considered at the same level as feature films. Would you make just one big bunch of them only because they are all YouTube videos? Until there will be a way to tell one kind of product (the professionally thought and produced) from the other (the amatourish) when they appear on the same platform, the ‘official’ industry will continue to ignore them, for the simple reason they have no way to count them. Statistics do have their parameters. If the parameters don’t match, there is no meaningful confronting of datas. In my mind, what publishers and Indies think is irrelevant. The only thing that matters is what readers think. 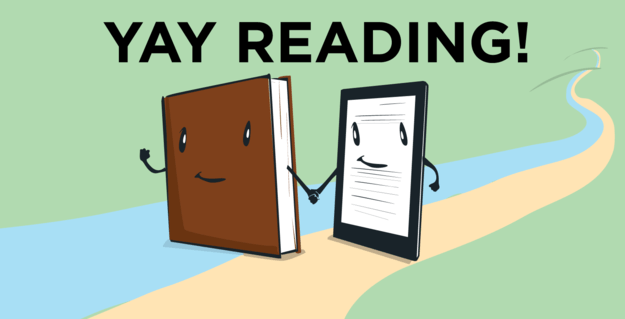 So far, readers buy half their ebooks from Indies. Publishers are free to ignore that fact at their own risk. Personally, I think the statistics do show us something interesting: that in spite of traditional publishing and indie publishing being both about publsihing stories and information, the difference in modus operandi and approach of the reader may create two markets that are actually quite different, and readers will move from one to the other depending what they’ll be seeking at a particular moment – I think in fact readers are already doing this. That’s why I don’t think comparisons are very meaningful for one market or the other. They will travell on different tracks, like trad publishing and pulp publishing did in the past. This is my impression at the moment. An interesting reading of the stats. Personally, I don’t care if a book is Indie or traditionally published. I rely on word of mouth and personal curiosity to pick a title. So, I guess my reading of the stats has been influenced by my own bias. Most people I know who buy e-books just keep buying them, and storing them electronically. They still read at the same rate though, so generally have so many to catch up on. I see no indication of falling demand myself, but I have noticed some shift in the genres that people prefer.